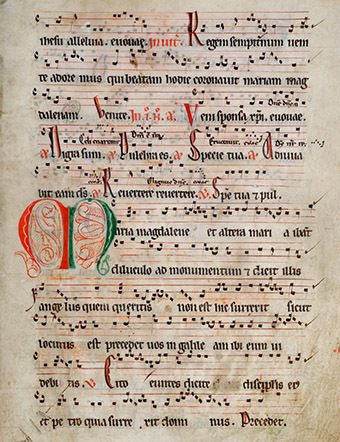 Rare Music comprises music manuscripts, printed scores, books, archival collections and other music-related materials that are rare and in some cases unique. The collection includes items from the late 11th century through to the present day. Our rich holdings of European music have at their core the Hanson-Dyer Collection of 15th to early 19th century music imprints, first editions and music manuscripts. Transferred to Melbourne in 2005, this 245-item strong collection includes French operatic works, British publications, works of the Italian renaissance and books on music theory, establishing collection strengths that have been built on with recent acquisitions. Rare Music also includes the very substantial archive of the French music publishing house, Editions de l’Oiseau-Lyre (1932–2013), founded by expatriate Louise Hanson-Dyer (1884–1962). Editions de l’Oiseau-Lyre is celebrated for its scholarly and pioneering editions and sound recordings of early music. Barry Tuckwell Collection: the French horn virtuoso’s music, recordings, correspondence and other material. John Hopkins Collection: the Australian conductor’s personal library of orchestral score. Stockigt Clarinet Collection: music previously owned by Jim and Hugo Stockigt. White Clarinet Collection: the professional music library of Thomas White. Albert H. MAGGS Composition Awards: scores of commissioned works (1967–) by recipients of the annual award administered by the University of Melbourne. Concert and Theatre Programs: a large collection with a focus on musical life in Melbourne (1860–). The majority of Rare Music is catalogued with over 12,000 items searchable through the University Library Catalogue.